Located not far up Main Street from Compare Foods Spring Valley, this Bravo Supermarket resides in a former Grand Union. I doubt Bravo did extensive exterior renovations, but the metal awning is possibly new. 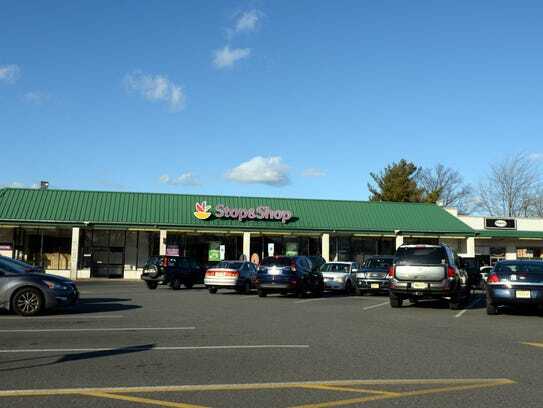 However, it does resemble the now-closed Waldwick Stop & Shop, which was a GU. The "catering" sign at left is new, though. I like these window decals. I believe this is the back of the customer service counter inside. They really brighten up the front of the store. You enter into the small produce aisle. Although the owners get points for how neatly stocked everything is, and the baskets along the cases on the left, they lose those points for the awful center displays. Come on, really? A plastic bucket sitting on a cardboard box? Those plastic center display tables are also horrible. I don't mind the old fixtures but I wish those center cases were different. 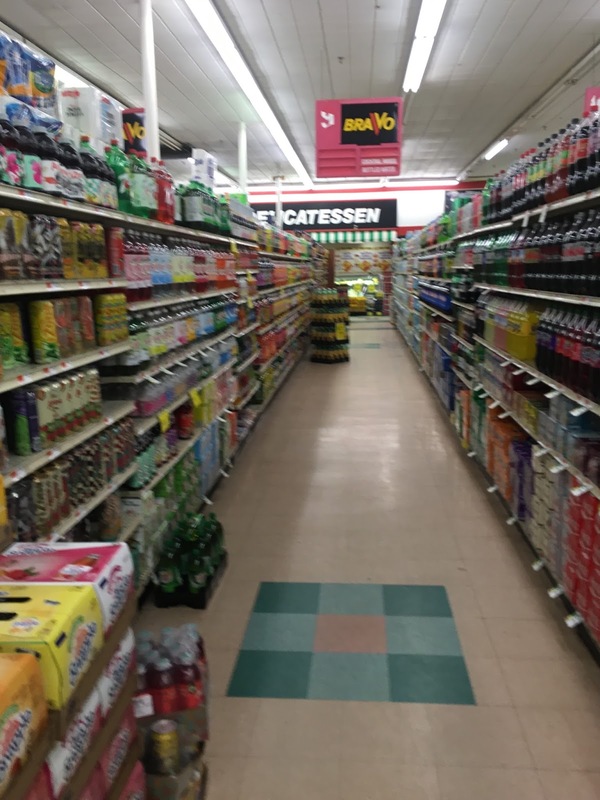 Here you can see towards the front of the store and how the front part of the aisle is double-wide. Okay, enough complaints about the displays; otherwise, this store (although pretty old), was good: CLEAN and well-stocked, if a little on the dingy side. The aisle markers are probably original GU. The logo shown on them is the old Bravo logo, which this store would have opened with on the outside. You can see how very little has been done to the decor from GU, just new signs would have been fitted into the old sign frame, and the walls were painted. I believe the "World of Foods" signs are new. The "Thank you for shopping Bravo" along the front-end is new. The floors look old enough to be left from GU, but could easily have been replaced by Bravo. There is a small deli in the back corner of the store. There is no seafood, which Compare has, and no hot food, which Compare also has. This store looks to have sold hot food at one time, as there are hot food cases with displays stacked in front of them in the corner. You can see some of the aisle numbers are peeling off here. In the front was a small alcove labeled "baked goods", despite the lack of any baked goods in this general vicinity! I don't know what GU would have had here. Also notice the old-school mirrors for security. The store also has updated security cameras. Here we can see past Customer Service along the front end, back towards the entrance. The store is small and typical of a GU of maybe the 1950s. This was my first Bravo and I was impressed with the prices, freshness, and cleanliness, but the store is seriously outdated. The decor, while well-maintained, is sorely in need of replacement. The flooring is also due to be redone. Otherwise it's a pretty decent store, and worth checking out for its history.